Whether you’re a professional or a hobbyist, there’s no denying that some machines and accessories we just can’t live without, especially when it comes to creating our favorite pieces. One of the most popular machines used today to help with a range of art, imaging, and craft work is a vinyl cutter, known for its versatility and power. The vinyl cutter has evolved from something that started as quite a heavy duty device and has since become smaller and easier to own for the home hobbyist. There are now many variations of vinyl cutter machines that sit comfortably on desktops, and these devices are no longer just for those with professional and commercial projects to work on. If you’ve been deciding whether or not to invest in a vinyl cutter for your home workshop, chances are you don’t yet know all of their capabilities. Although the initial price tag may set some people off, this worthwhile investment is able to do so many projects, arts, and crafts, and will add efficiency and productivity to even the busiest workshop. As a somewhat technical machine, it’s best to have an understanding of how these devices work and exactly what they do to make life so much easier. With a quality vinyl cutter in your home or professional workshop, though, you’ll wonder how you ever lived without one once you learn just how valuable they can be. What Can A Vinyl Cutter Do? How Does A Vinyl Cutter Work? When trying to understand a vinyl cutter and how it works, the best way to imagine it is to think of a traditional printer. The printer receives data about imagines from another source, usually a computer, and then uses this to print images onto a bit of paper. This is similar to how a vinyl cutter works, only rather than printing an image it relies on small blades to cut the pattern of the image into the vinyl or other material. The first instance of a vinyl cutter was invented in 1888 when a Canadian inventor devised the machine that could cut through fabric. This machine was mounted onto a motor which was then mounted on a platform which would serve as the base for cutting. Although bulky and difficult to operate, this invention began the long line of cutting machines that eventually led to the compact and efficient variation we know today in home workshops around the world. Although traditionally owned and operated by those in the sign making industry, vinyl cutters are now more popular with those who enjoy arts and crafts at home. Because they are so versatile in what they can do and allow for an aspect of creative freedom, they’re now commonly found in home workshops as they work well with a range of mediums and are easy to operate. There are different sizes and scales depending on the type of work they’re used for, ranging from compact desktop cutting machines to larger scale professional grade devices used in workshops. One of the reasons vinyl cutters have enjoyed such huge success in both home and professional workshops is due to the variety of materials they can work with. Even the most basic home desktop vinyl cutters are capable of achieving quite a lot, and they are an integral part in producing many different types of arts and crafts projects. In terms of professional grade vinyl cutters, these are commonly found in any industry that uses a sign printer. When buying a vinyl cutter for a larger scale use like this, there may be different specifications and features that you would deem important. Although there are hundreds of different makes and models of vinyl cutters, they all operate in the same basic way. A vinyl cutter is made of a computer system and a small blade, with the computer dictating to the knife where to cut. The material is fed into the device on the cutting platform and this is where the cut is performed. 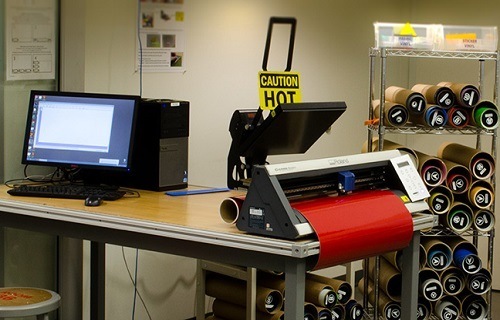 Once done, the excess material is weeded or removed and the final image is printed. Designs can either be programmed into the cutter or uploaded through the use of specialized software created for the machine. If you’ve never used a vinyl cutter before, there are just a few simple steps to do so. For beginners, it’s best to start with a simple project such as making a sticker. Keep in mind, though, that you should always refer to the owner’s manual which comes with your vinyl cutter for more accurate directions. Find an image that you want to use as a sticker, by either using the pre-programmed designs that come with your vinyl cutter or creating your own. Images can be made on a number of programs, depending what’s compatible with your machine, and then saved as a JPEG file for printing. Open the software which came with your cutter and import the image you’ve created. Make the required changes to get it to the right size, and remove anything you don’t wish to print. Load the vinyl you will use to cut into the machine, being sure to insert it in line with anything sensors that the vinyl cutter has. This is to ensure it’s aligned correctly and will print the right way. 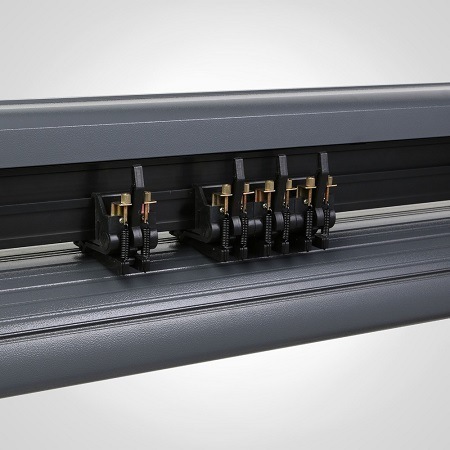 Press the rollers down onto the vinyl so they have a firm grip on it, and check everything is lined up by looking at the system’s display. Once everything is ready to go, you can press the ‘cut’ button or corresponding button depending on your machine. The cutter should move from side to side and the vinyl will move back and forth, indicating that it’s working. Once done, move the vinyl carefully out of the machine and your design will be ready to go. Each machine will have their own set of instructions for how to get the best use out of it, however, most desktop vinyl cutters work this way. Once you get the hang of how to achieve the best results, it will take no time at all to feed through the vinyl and other materials and get the perfect cut. If you’ve never shopped around for a vinyl cutter before, it may be quite overwhelming when you finally do. There are hundreds of different makes and models available, and all with their own unique pros and cons to the user. There are two things to consider with the size of your vinyl cutter to see which is right for you. Firstly, the size of the machine itself will be determined by how much space your home workshop has. Secondly, the size of the cutting area means how much material you can feed into it. For larger jobs, you’ll want a device that can work with around 25” or more. The speed of a cutter determines how fast it can cut, and this is usually measured in millimeters per second. However, the speed of the cut is not a determination on how precise it is, so don’t consider this the most important feature when shopping around. The memory of the vinyl cutter’s computer is responsible for storing past designs, and sometimes holding the pre-programmed patterns and designs that the manufacturer uploaded. 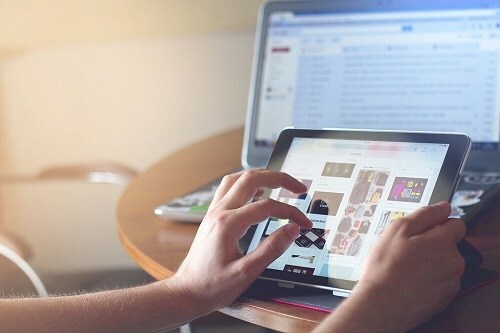 These devices can often connect with a computer which can store the important details, so it’s not always important. The force and pressure of the blade are important for determining how precise the cut will be, and the types of materials it works with. For home use, the force isn’t as crucial as it would be for a professional workshop cutter which is being used all day and for bulk projects. The capabilities of a vinyl cutter refer to the different materials and surface it works with. Although called a vinyl cutter, these machines are actually designed to cut through things like fabric, tint, transfer material, cardstock, and paper. However, always refer to the manual of your specific machine to see what it works with best. This is a laser pointing device that allows your machine to contour cut. Contour cutting is ideal for use with materials such as iron on transfers, as it allows you to cut away the excess and just leave you with what’s needed for your design. This can give up to 0.1mm of accuracy which makes it the most precise cut available. 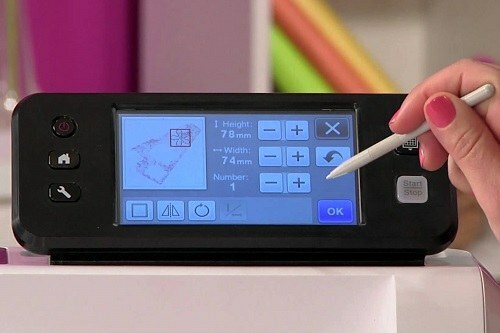 Not every vinyl cutter comes with a scanner inbuilt, however, most modern ones do. This enables you to create a drawing which is then scanned into the machine, and then used to cut into the material of your choice. Scanners are measured in terms of DPI which indicates how high the resolution will be. Ultimately, finding the best vinyl cutter for your home workshop will depend greatly on the type of projects you’ll be using it for. Someone who makes signs and stickers professionally will have different needs to someone who creates iron on transfers for fun, so you should have a good idea of your own requirements before you even begin looking around. One of the essential features to consider in a vinyl cutter is the motor, as this will have a huge impact on how it functions. There is often debate about whether stepper or servo drive motors are best in a vinyl cutter, but each has their good and bad points. Basically speaking, a servo motor is just like a regular motor which has an encoder disk on the back. This disc is usually read by an optic and it has a brake in it too. As the motor spins, its position is read by the encoder disk and then breaks or stops the shaft as required. A stepper motor is operated by different magnets that are cut up into different sections. These magnets rotate as they are pulsed, and can reach up to 200 notches per revolution depending on the motor. Although it might sound complicated, there are a few simple ways that one might be better than the other. The biggest advantage to using a servo motor is that they’re far quieter than a stepper. While this might not be a big deal in a professional workshop setting with other machinery running, it’s a major factor to consider when purchasing a home workshop vinyl cutter. The stepper motor is not without its advantages, though, with the main one being their accuracy when working with thinner materials. While it’s true that a servo motor might be best with thick materials like those over 0.03”, the reality is that not many home workshops will be using a desktop machine for this and so a stepper motor will give you a more accurate cut. Before making your decision, you’ll also need to consider the cost of repairing the motor should anything go wrong, so you should factor in the price and availability of parts. For small desktop vinyl cutters it will be easiest to replace these under warranty, so ensure you are covered for breakages and faults with the device’s motor as well. Though there are hundreds of different vinyl cutters out there, just a few of these are trusted and reliable brands. 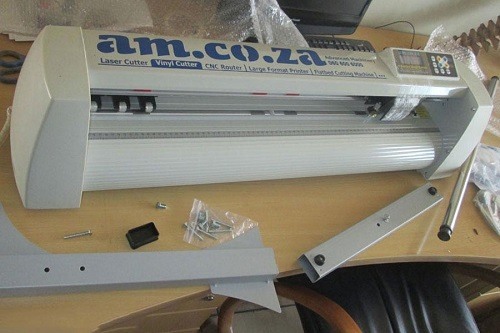 For the home user especially, you need to shop around for a brand that is known for making innovative and efficient machines, as there’s nothing worse than getting your new vinyl cutter home to find out it can’t meet your needs. Here are just a few of the top manufacturers of vinyl cutters, and how they stand out from the rest. Known by anyone in the business of design, art, and technology, Roland has a knack for creating machines that are ideal for the home and professional workshop. A Roland vinyl cutter will always feature innovative aspects, and be made with the highest of quality. This brand is known for making just one thing, and they do it exceptionally well. 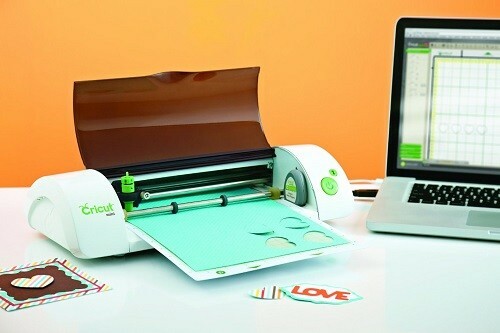 The Cricut vinyl cutter comes in many different forms, and each of them has been specifically designed to suit the environment they’re in. Whether it’s a small scale desktop machine or something larger and commercial, Cricut can help you be your creative best with devices that are user-friendly and easy to operate. Loved by arts and crafts enthusiasts the world over, Silhouette is known for making imaging and printing machines that are best used at home. The range of Silhouette vinyl cutter gives the home user a simple and easy way to get creative, with plenty of machines, tools, and accessories that can help you achieve your passion. Making everything from cutters to engravers and printers, GCC is no stranger at developing machines for the home and business. 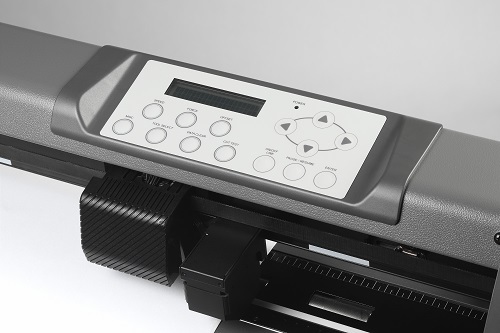 GCC vinyl cutter devices are both big and small, depending on your needs, and feature the latest innovative software. Whether you’re a professional sign maker or home hobbyist, GCC has a cutter out there for you. Most people would have owned a Brother product at some point or another, thanks to this company’s continuing innovation in all digital and imaging devices used for the home and office. The range of Brother vinyl cutter machines is designed mainly for home use and come with other built in functions such as scanners and printers so you can get more from just the one machine. 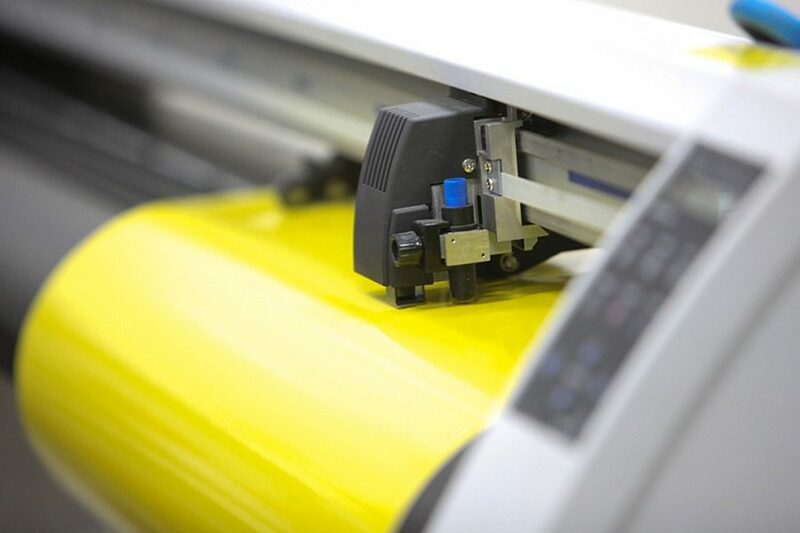 As a powerful machine that you’ve invested money and time purchasing, you want to be sure you’re caring for your vinyl cutter the best you can. Although most of them are covered by a generous warranty, there are some things you can do to ensure you get the most life out of them and that they stay operating to the best of their ability. The blade of your vinyl cutter is the most important part, as it relies on this to perform a precision cut. Always check your blade to see if it’s showing signs of bluntness or wearing, as you’ll need to replace it as required to ensure it’s cutting as well as it should be. The cutting strip runs parallel to the blade and will need to be replaced if there are signs of visible cuts. Keep this strip free from dust and debris so it works its best otherwise it will make a bumpy path for your cutter. Regularly wipe down the outside of your machine to keep dust away from the buttons and smaller parts. Clean the blade and blade holder after every few uses to extend their life as well. Pressurized air is ideal for getting into the small cracks and crevices, being careful not to do any internal damage. Never perform a cut outside of the guidelines otherwise you can damage the machine and blades. If you do damage it due to overreaching the guidelines, there’s a good chance your warranty will be void and you will have to pay for a whole new machine. Just as you would with any electronic device, be careful to keep them away from water or open windows. Keep the dirt and dust out, and change the blades as required, and you will be rewarded with a high performing vinyl cutter that lasts for many years. 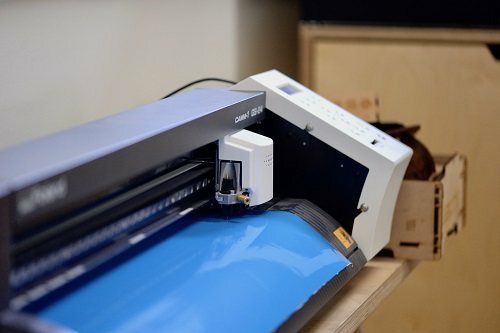 There aren’t many machines these days that offer the versatility of a vinyl cutter, and they’re a must have for anyone who enjoys arts and crafts at home. Whether you want to make a new t shirt, cut some fridge magnets, or create your own line of stickers, there isn’t much that this handy machine can’t do. 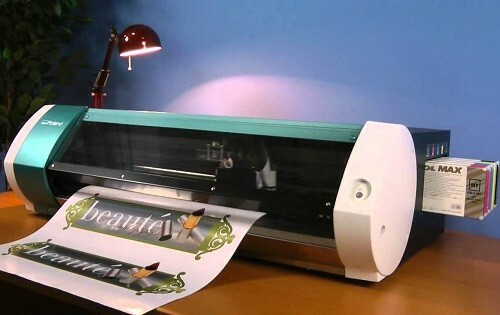 A vinyl cutter works just as well with vinyl, stickers, transfer sheets, cardstock, paper, and fabric, so this machine will only go as far as your imagination will take you. Because a vinyl cutter can be such a huge expense, it always pays to do your research before you commit to a machine. You should have a good understanding of the capabilities you’re looking for in a vinyl cutter, and what you intend to create with your device. This will give you the best chance of finding a machine with the specs and features that suit your needs. If you’re a home hobbyist who loves to make arts and crafts, there’s so much you can achieve by investing in this one simple machine. With the efficiency and innovation of a quality vinyl cutter in your workshop, you’ll be able to turn your small time passion into something more and possibly begin a home business thanks to your favorite new machine.